submitted by community skinners with one to be selected as the theme for a skinning project. When the voting was done two skins were tied, QED and Neptune by Master Skinner Vampothika. Xiandi's WindowBlinds is just another example of why her skins are popular in the community, nice colors, cool graphics and some great animation. 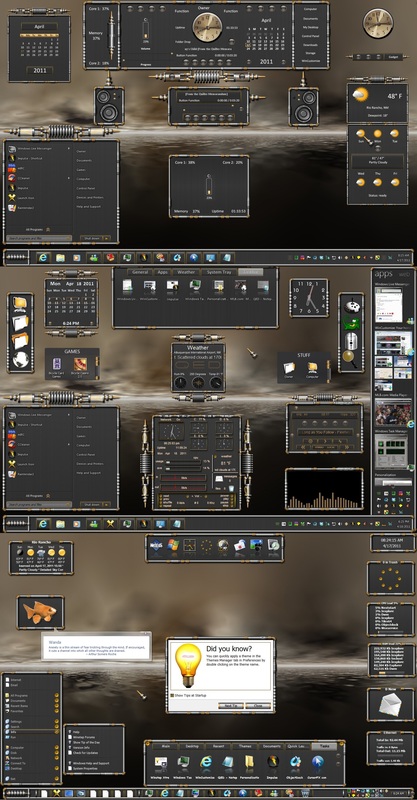 In the screenshot you will see three desktops showing most of the skins below and Fences and Tiles. As you can see there are many ways that you can set up your desktop with this Suite. Using just some or parts of all the skins. I can not imagine that any one desktop will come out looking the same as another. Have fun. skinners can not add to the list of themed skins. It would be nice to see a Rainmeter or other skins for any of the other categories in the WinCustomize Gallery. The Community hopes you enjoy this WinCustomize Community Skinning Project, and as always, have a great day. Great jobs by all skinners! Thanks Philly!! It's good to see you doing all these themes. Thanks for the trouble that you take.